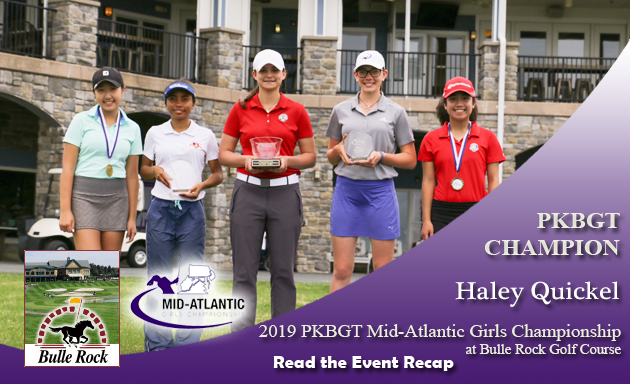 On Sunday, April 14, the Peggy Kirk Bell Girls’ Golf Tour played the final round of the 2019 PKBGT Mid-Atlantic Girls Championship at Bulle Rock Golf Course in Havre de Grace, MD. Shadowed outlines of junior girls golfers were barely visible just 100 yards away from the practice putting green at the check-in table at Bulle Rock Golf Course early Sunday morning. The scenic overlook of the 18th green from the second-story outdoor balcony of the clubhouse was blocked by a layer of dense fog. For the second weekend in a row, the final round of a PKBGT Championship event was put on hold, delayed by the blinding and eerie ambiance of hazy fog. The PKBGT wasn’t the only golf tour that Mother Nature tested on Sunday. In Augusta, tee times were moved up to avoid the impending heavy storms. In Havre de Grace, it was a waiting game for visibility to clear so the field of 45 could take the course for a final showdown with the former host of the McDonald’s LPGA Championship. The practice facilities crowded with players eager to make a push in the final day of competition, vying for the coveted PKBGT glass bowl trophy. 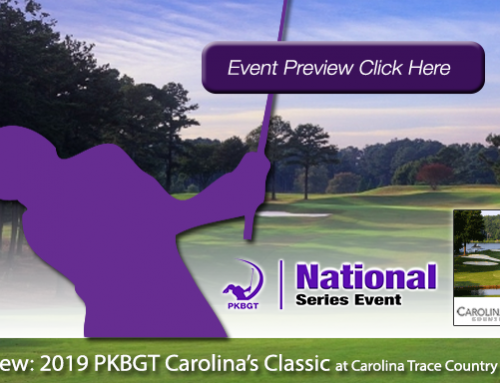 In partnership with the MAPGA and MSGA, the 2019 PKBGT Mid-Atlantic Girls Championship brought together the best of the Mid-Atlantic region and beyond for a premier championship event. At the completion of the first round of play, several players posted impressive scores atop the leaderboard. Two strokes separated players within the Top Five of the Bell Division while the Futures National leader jumped out to a four-stroke lead. As the delay drew to a close and the fog very slowly dissipated, players marched to the first tee mentally prepared to best their previous day’s performance. Spotters stood along the first fairway for the opening groups to locate drives through the pesky, lingering fog. By the turn, you could see for miles along the scenic layout of Bulle Rock GC. 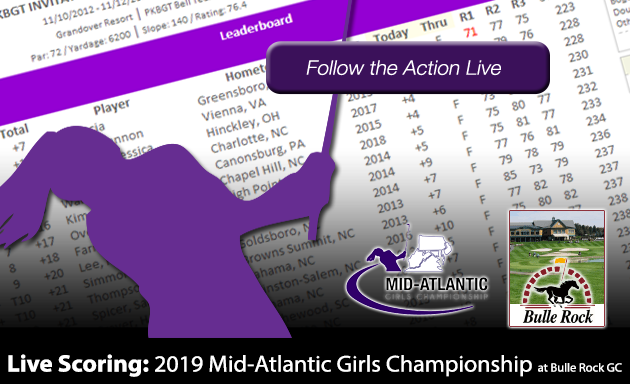 When all was said and done, here is how the leaderboard fared at the conclusion of the 2019 PKBGT Mid-Atlantic Girls Championship! 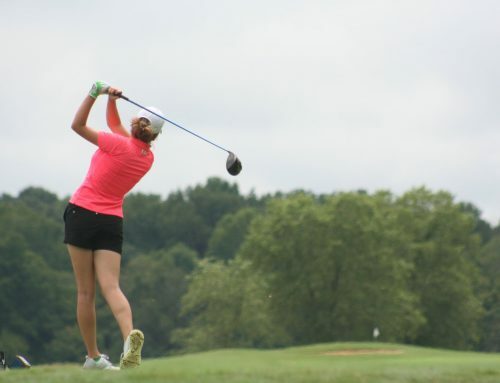 While the first round left the top of the leaderboard congested, Haley Quickel (Middletown, DE 2020) separated herself from the pack early and never looked back. Opening her round with a birdie on the first hole, Quickel would tack on another to close out her front nine and two more in the midst of her victory lap of a back nine. 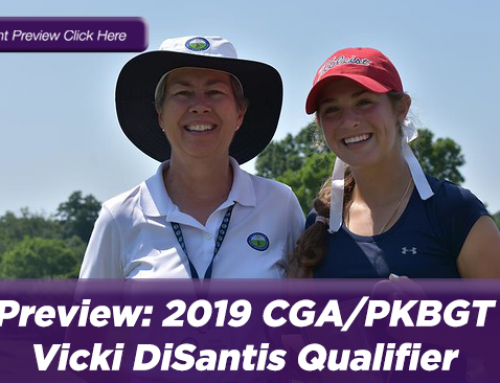 Finishing the weekend with a two-day total score of 73, 72 = 145 (+1), Quickel leaves Havre de Grace as the winner of the 2019 PKBGT Mid-Atlantic Girls Championship in the 26 player Bell National field. Sticking close together, Paris Fieldings (Suffolk, VA 2023), Hannah Lydic (Ocean View, DE 2022) and Faith Mcilvain (Elicott City, MD 2020) finished in a three-way tie for second place. All three finished with two-day total scores of 150 (+6). Fieldings posted the best second-round score, finishing the event with scores of 74 and 76, winning a tiebreaker for the second place trophy at the awards ceremony. 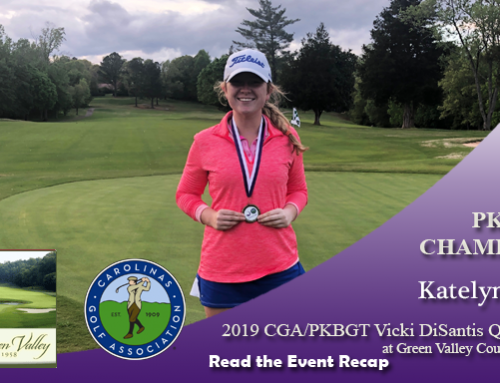 She scored three birdies on the afternoon including one on the 17th hole, adding an exclamation point to her afternoon. Lydic finished with scores of 73 and 77 on the weekend. 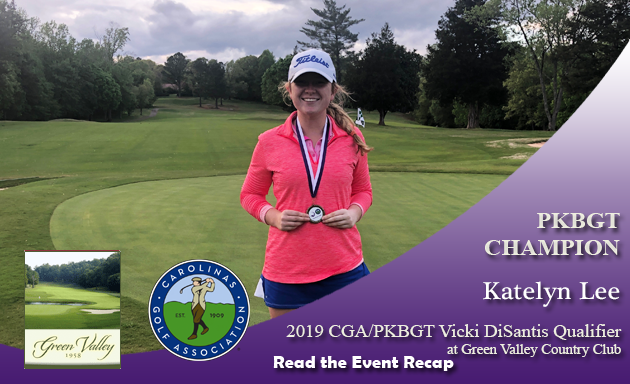 She eagled the par-four 16th hole in her final round as the highlight to cap off her tournament. Mcilvain fell victim to a tough back nine on Sunday, but she had two birdies on the afternoon. She leaves the weekend with scores of 72 and 78. Rounding out the Top Five in the Bell National division, in a two-way tie for fifth place was Angelina Tolentino (Mount Laurel, NJ 2024) and Megan Meng (Pennington, NJ 2024) with two-day total scores of 152 (+8). Tolentino closed out her tournament, and an impressive Sunday performance, in style with a chip in for birdie just off the 18th green. She finished the weekend with scores of 78 and 74. Meng’s best hole of the afternoon was a kickstart to her back nine, a birdie on the par-four 10th hole. She ended her tournament with scores of 74 and 78. Entering the final round of play with a considerable lead over the rest of the 18 player Futures National field, Josephine Nguyen (Springfield, VA 2023) held on for her first win of the season. 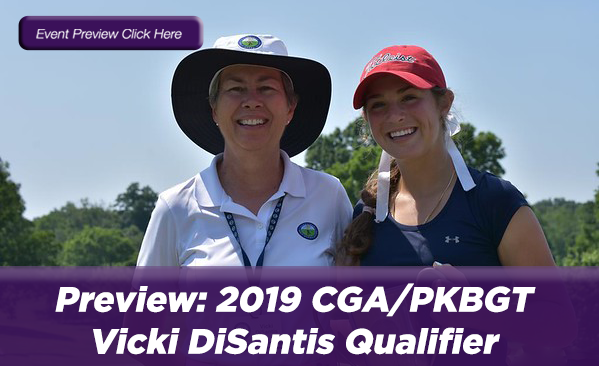 Her two-day total score of 74, 79 = 153 (+9) was three strokes better than the next closest competitor, more than enough to earn the crown as champion of the 2019 PKBGT Mid-Atlantic Girls Championship! Finishing in second place after shooting the Futures National low score in Sunday’s final round was Sarah Lydic (Ocean View, DE 2024). Lydic finished with a two-day total score of 81, 75 = 156 (+12). 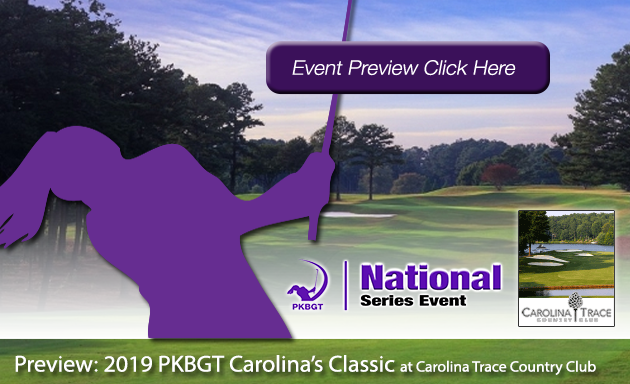 She caught fire with three birdies on the afternoon including one on the 16th hole, the same spot her sister sank an eagle in the Bell National division. Christina Cupelli (Fairfax, VA 2021) finished the weekend in third place after posting a two-day total score of 78, 79 = 157 (+13). Cupelli started her final round strong on Sunday morning with a birdie on the opening hole. With a two-day total score of 80, 81 = 161 (+17), Katie Vu (Fairfax Station, VA 2024) finished the tournament in fourth place. Closing out the Top Five in the Futures National division was Delaney McCoy (Virginia Beach, VA 2021). McCoy finished in fifth place with a two-day total score of 86, 77 = 163 (+19). We would like to extend our greatest thanks to the staff at Bulle Rock Golf Course for their incredible hospitality throughout the weekend. Special thanks to the MAPGA and the MSGA for their partnership in putting on the championship event. 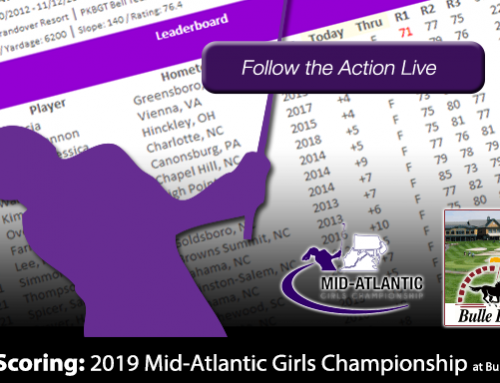 Congratulations to all of our top finishers at the 2019 PKBGT Mid-Atlantic Girls Championship!